The kids have now been back in school for two full weeks. Before school started, I spent some time prepping breakfast and lunch foods for the weeks to come. I also spent time prepping the kids for a new schedule change. Together, we practiced morning and evening routines over and over again. 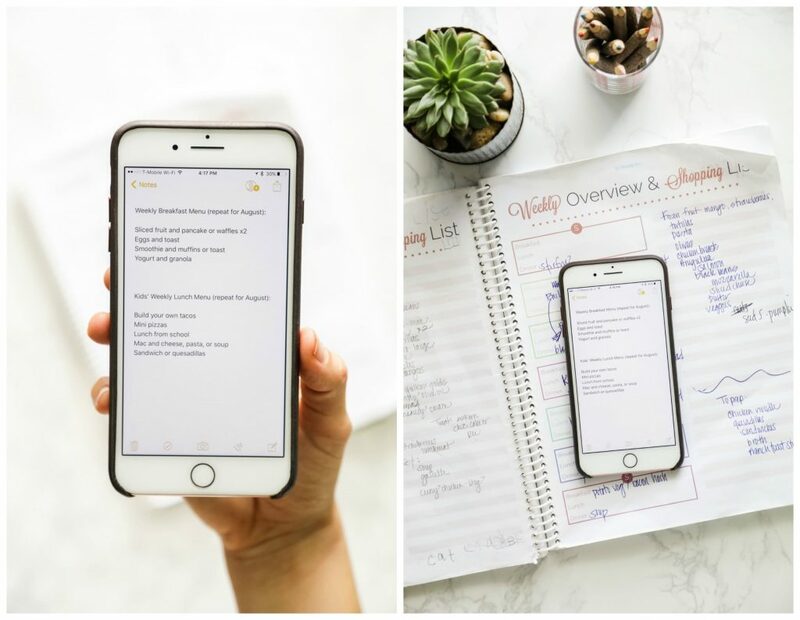 I think these small, intentional actions have helped make the transition back to school a bit smoother. I’ve found that many of the frustrations I experience in life are a direct result of thinking that life will magically organize itself. Sure, there are many things one can’t control, but there are also many things that can be with systems in place and a bit of advanced prep work (i.e. laundry, meals, and even finding socks for the kids on busy school mornings). In the past, school mornings have been a time of frustration for me, due to everything that must get done in such a short period of time. Taking a few intentional actions, like prepping breakfast and lunch foods, creating a morning routine, and waking up a couple of hours before the kids, has made a huge difference for me and my family. These small actions have brought a feeling of calm to our home even on the busiest of school mornings. 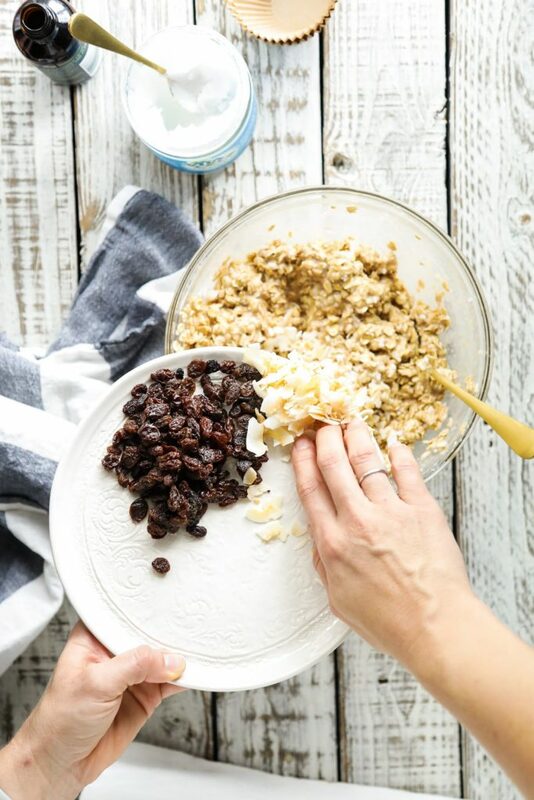 One of the foods I prepped before school started, and have continued to restock as our supply runs out in the freezer, is a baked oatmeal cup recipe (perfected by Helen on the Live Simply Team). 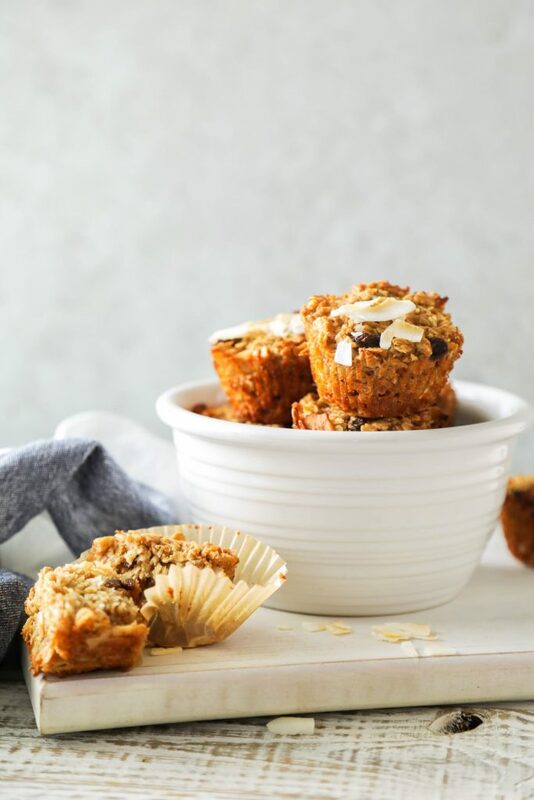 Baked oatmeal cups are made with oats, applesauce, a bit of sweetener, some milk, and any add-ins (chocolate chips, fruit, etc.). 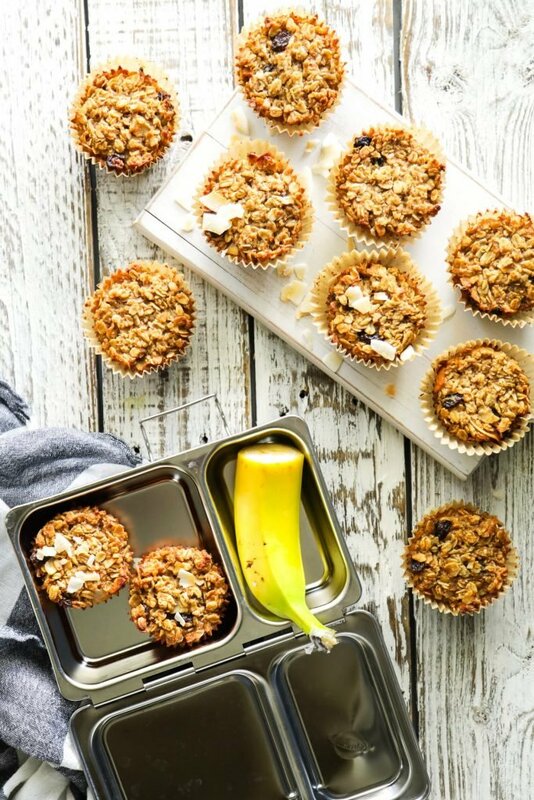 The final result is muffin-style, portable oatmeal. Once cool, the oatmeal cups can be stored in the freezer for up to several months, or stored in the fridge for up to a week. 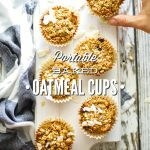 The oatmeal cups are one of the foods on my make-ahead breakfast rotation, along with waffles, pancakes, and smoothie packs. 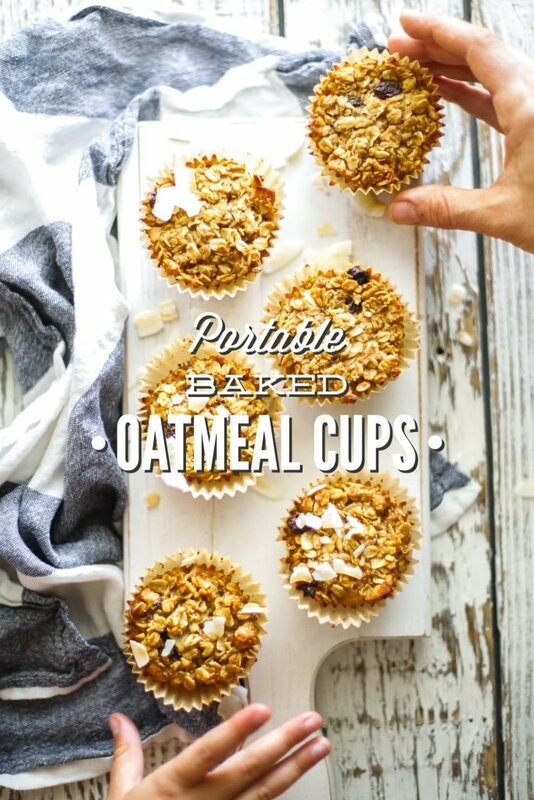 Muffin-style, portable oatmeal cups. The oatmeal cups can be stored in the freezer for up to several months, or stored in the fridge for up to a week. 3/4 cup milk of choice (200g) whole milk, almond milk, coconut milk, etc. Preheat the oven to 375F. Grease (I like avocado oil spray) or line a 12-cavity muffin pan. 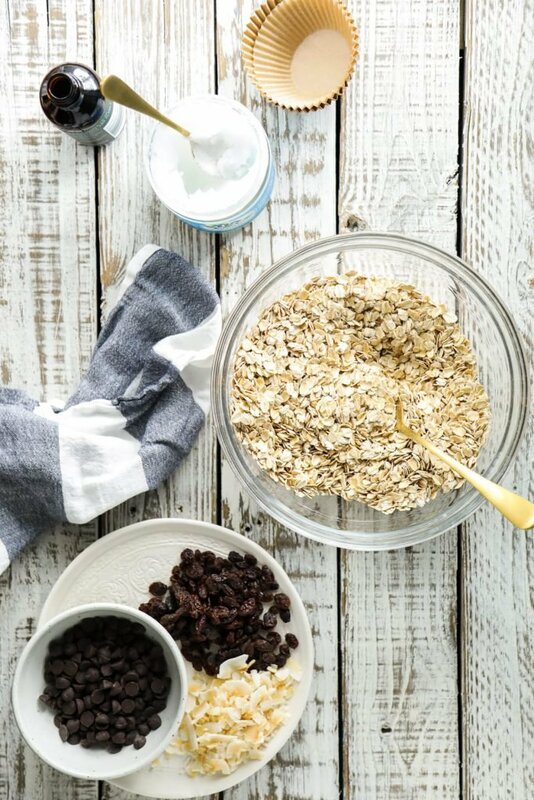 In a large mixing bowl, stir together the dry ingredients: oats, cinnamon, baking powder, and salt. 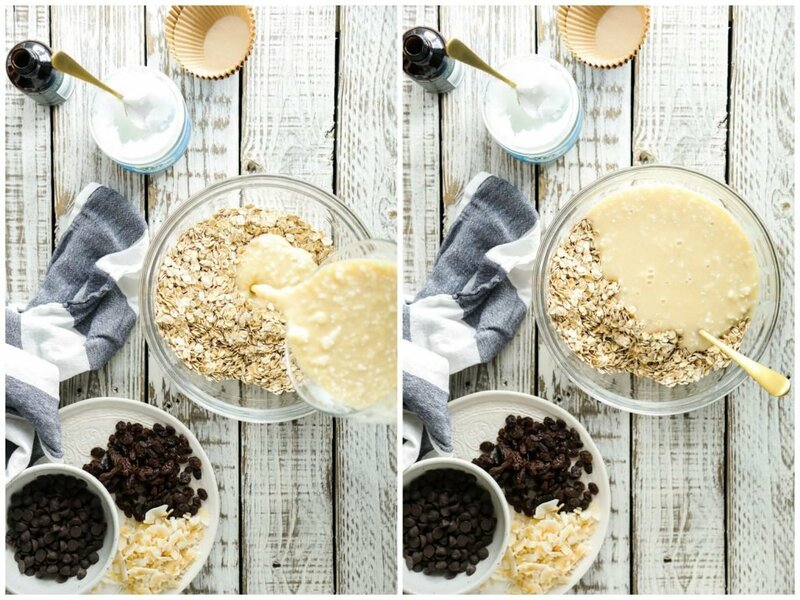 In a medium-size mixing bowl, whisk together the wet ingredients: milk, applesauce, honey, vanilla extract, and melted coconut oil. Add the wet ingredients to the dry ingredients, and stir to combine. Fold in up to one cup of add-ins. 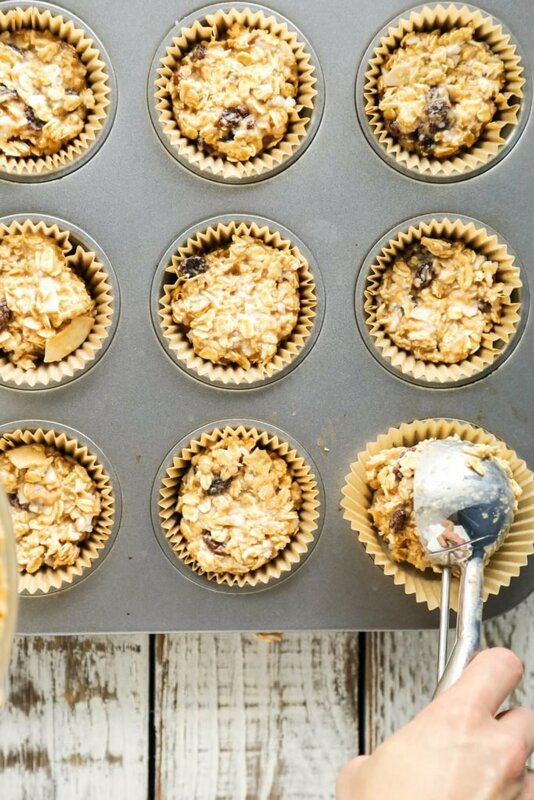 Divide the oatmeal mixture evenly among the muffin cups. I use an ice cream scooper, and then gently press the mixture down in the muffin cup with my fingers. Bake for 20-25 minutes, until the centers are firm to the touch. Let the pan cool, preferably on a wire rack, for at least 15 minutes. The oatmeal cups will firm up as they cool and shouldn’t be removed from the pan too quickly. Do you think I could use coconut butter instead of coconut oil in this recipe? I am excited to make them! Hey Julie, You’ll need an oil or butter. I don’t think coconut butter will work for this. Enjoy! Is there a substitute for applesauce? I don’t have it and I would like to make these tomm morning ! Hey Mary, Yes, pumpkin puree and mashed banana. These look great! I hope you and your family are all safe from Irma, praying for you guys. Thank you for this recipe! I was so happy to pull them out of the fridge this morning for a quick breakfast. My kids woke up early and I hadn’t even managed a cup of coffee yet. I was thrilled to remember I made these the previous night and they made for a delicious instantly satisfying meal. Yay, Katie! That’s exactly how I envision this recipe being enjoyed by families. I’m so glad the oatmeal cups came in handy this morning. I hope you got to enjoy that cup of coffee! When you take the oatmeal cups out of the fridge or freezer do you warm them up? And if so, how? Hey Melanie, You can defrost them in the fridge overnight (from the freezer) and then just bring them to room temp in the morning, or you can warm them in the oven (about 300F) or the microwave (just a few seconds). I also like them cold, straight from the fridge. Hi, Kristen, I’m so glad you and your family are safe as well as your home. Can I grind the rolled oats a little? Will it change the consistency? My picky kids don’t like it whole. Hey Linda, Thank you so much. Hmmm, that’s a good question. I’m not sure what will happen if you grind the oats–I think it’s worth trying. These are amazing and they’ve become a staple during meal prep! But any suggestions to help them not crumble/fall apart so easily? Hey Maggie, I’m so glad you’re enjoying them. You could try adding an egg or two for a binding agent. So yummy! I didn’t have applesauce and used 2 farm fresh eggs instead. They freeze and reheat well. The kids love them. Thank you!